Mashable ha deciso di svecchiare le sue pagine con un nuovo layout più coerente e orientato all'esperienza social e al responsive webdesign. Il primo impatto è ottimo. 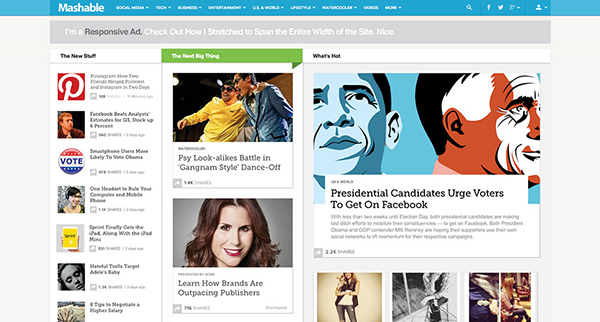 Much has changed since we launched our previous Mashable design. Social networks have evolved beyond personal updates to become venues for news discovery. Mobile phones and tablets have become an increasingly popular way to read Mashable on the go. Meanwhile, modern web browsers now let us make websites that work more like apps. What's more, we've seen the rise of visual social networks -- from Pinterest to Instagram, we're now all accustomed to sharing content that goes beyond the standard status update. When building the new Mashable, we separated our aims into three categories that reflect our audience's needs: Mobile, Social and Visual.